I SWEAR IF I MISS ONE FREAKING SNAP OF EVEN THE MOST POS UMASS VS HOLY CROSS OR WHATEVER THURSDAY NIGHT GAME BECAUSE YOU BLEW OUT ALL OF JACKSONVILLE’S SATELLITE DISHES I WILL HUNT YOU DOWN AND CUT YOU, JOSE, KATIA, LEE, AND YOUR WHOLE FAMILY. NOBODY WILL BE SPARED, NOT EVEN THE DEPRESSIONS. GO BEAT THE PISS OUT OF BERMUDA LIKE YOU’RE SUPPOSED TO. THEY DON’T GIVE A CRAP ABOUT FOOTBALL. I fully endorse Irene making a pilgrimage to Bermuda. Stay away from South Carolina. I don’t need a hurricane in my life at this time. Or any time. On top of the prospect of my traditional beginning-of-the-season football-a-thon being ruined, I just discovered a damaged tree on my church property that overhangs a neighbor’s house. Somehow I get the feeling that every tree guy in coastal SC is salivating as the sound of “ka-ching” rings in their mind’s ear. Irene, you are not welcome here! Am I missing something here? 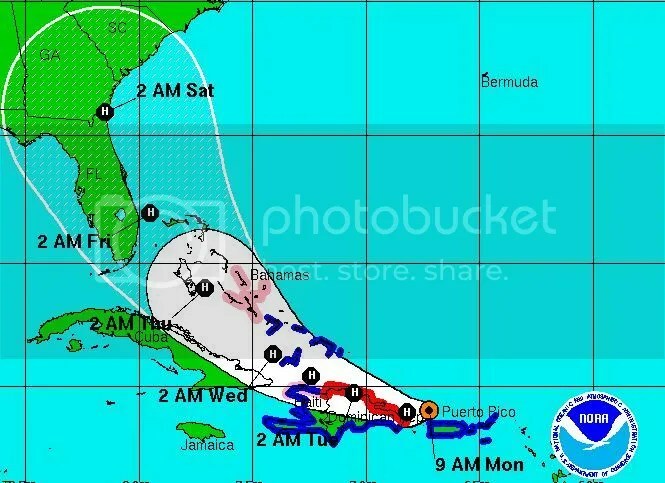 The hurricane track is for THIS weekend, August 26-28. I thought college football starts NEXT week – Thursday, September 1st. That gives you a week to repair your satellite dish or to move to west Florida. It gives me about 5 days to get the dish fixed, and after a hurricane that probably won’t be enough time what with all the power outages and downed limbs and all. Not to mention being one of 20,000 people who’d probably need service. or you can get up early and drive to a Pensacola bar. Last year it was predicted that about 8 hurricanes would make landfall in the US. The actual number was zero. You can take that to mean that (1) we are due or (2) you can believe all you hear from the weather service. You’re taking this post way too seriously, Dave.